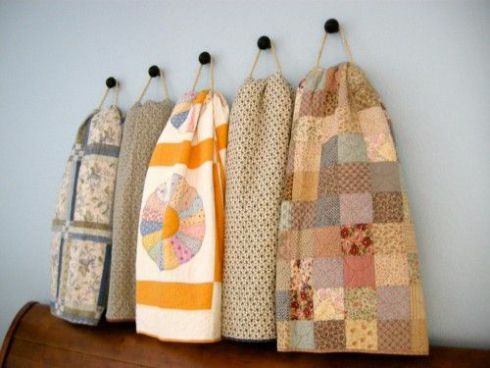 Whether you have a few quilts or a lot, it’s fun to think of ways to display them other than on beds. A large quilt on a wall not only makes a statement but also transforms a room into a welcoming place to gather and enjoy. 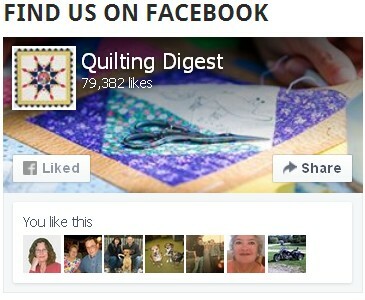 The thought of hanging a quilt is often followed by dread at having to create a sleeve to hang it from. 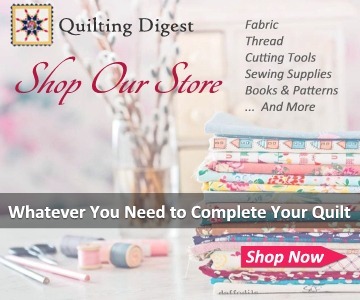 However, there are a number of ways to hang a quilt without a sleeve. 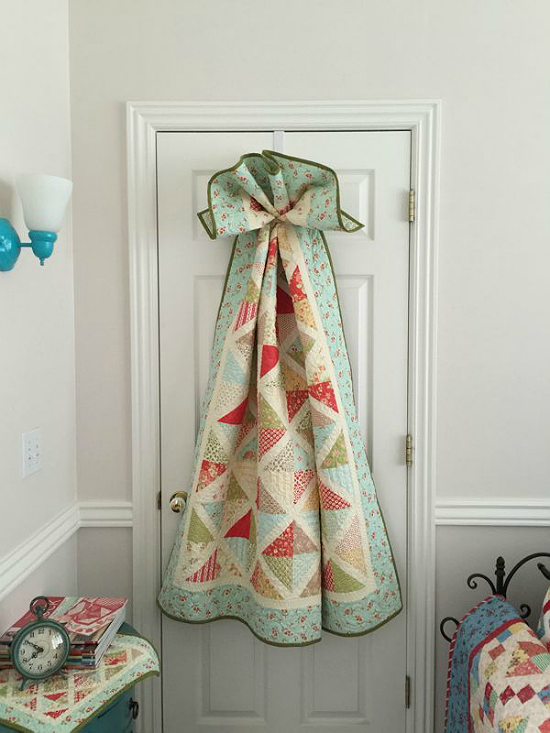 We hope the following ideas will help you think of a creative ways to hang your quilts. They’re all inexpensive and fairly easy to do, too. 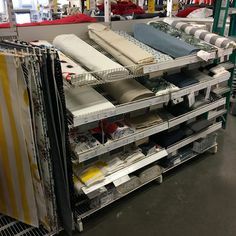 No wall space? 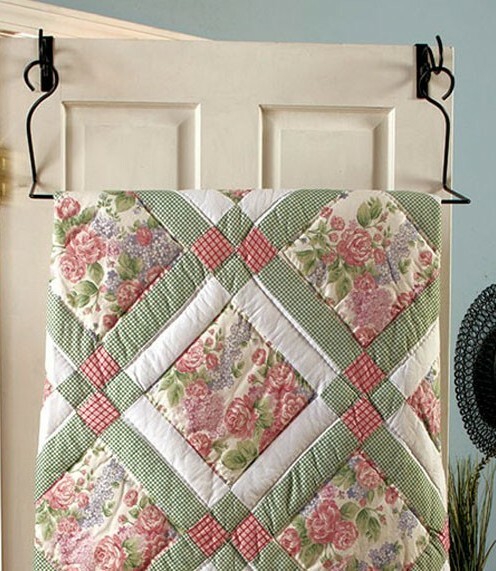 Hang a quilt over the back of a door using an embroidery hoop and an over-the-door wreath hanger. Learn more at Glo in the Dark Quilting. Affix drawer knobs to the wall and hang quilts with rope, ribbon, or pretty cords. From Old Village Cryer. 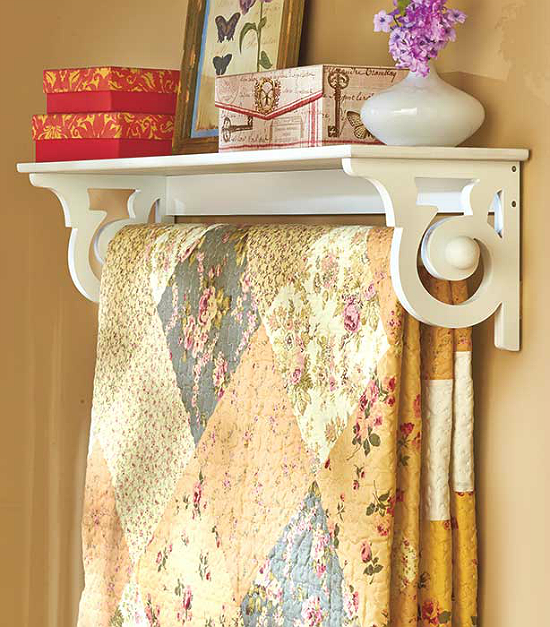 Hang a towel bar on the wall to display a pretty quilt. From Pinterest. While this is probably a purchased hanger, adapt the idea by hanging a cafe rod from a rope. 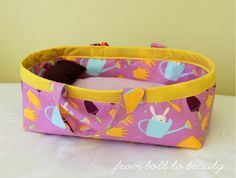 Check the dollar store for a star or other object to attach at the top. Found on The Painted Quilt. 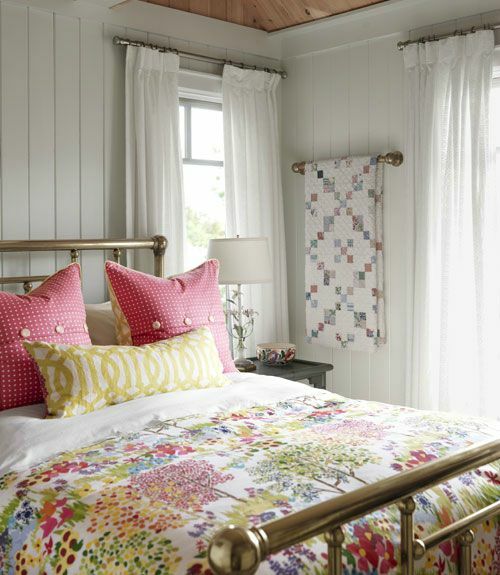 Create a headboard with a drapery rod. 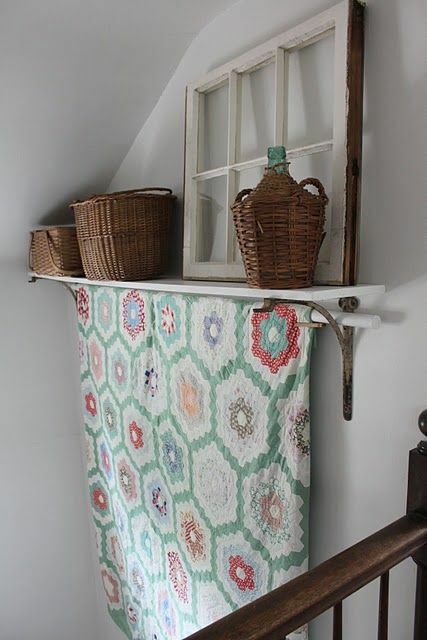 This is also a nice way to hang a quilt on any wall. No sleeves are needed if enough of the quilts hangs to the back side of the rod. From Good Housekeeping. Poke a clothes rod through openings in shelf brackets. 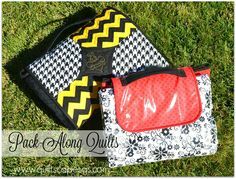 You won’t need a hanging sleeve if enough of the quilt falls to the back. Found on Pinterest. 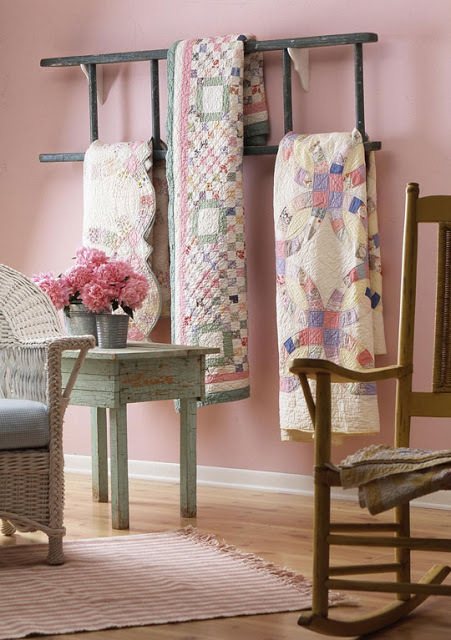 Old ladders make lovely quilt displays. If the wood is old, hide a towel or piece of fabric under the quilt to protect it from staining. Found on Eye for Design. 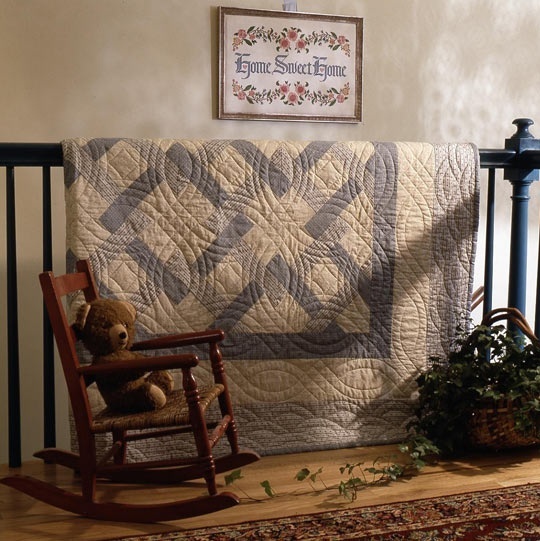 Railings are great for displaying quilts. Found on Eye for Design. 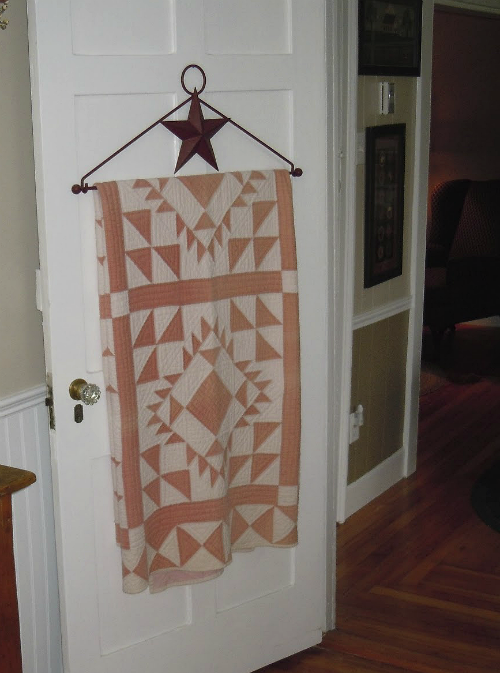 This may actually be a quilt hanger, although a wide over-the-door towel bar would work nicely, too. Shelves with built in hanging rods are especially charming. You’ll find a selection here. 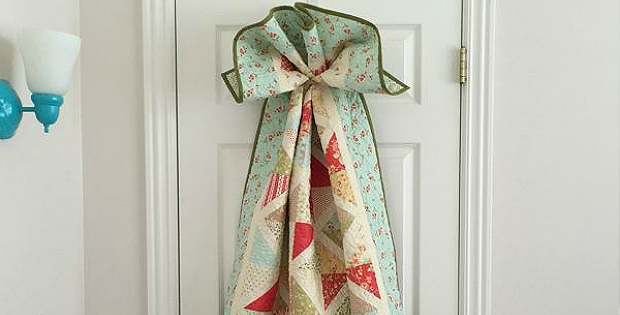 Now that we’ve given you some ideas, have fun decorating your walls, doors and railings with quilts!